The oldest ferry boat in Wisconsin still carries passengers and cars from Cassville WI to Turkey River Iowa as it has since 1833. 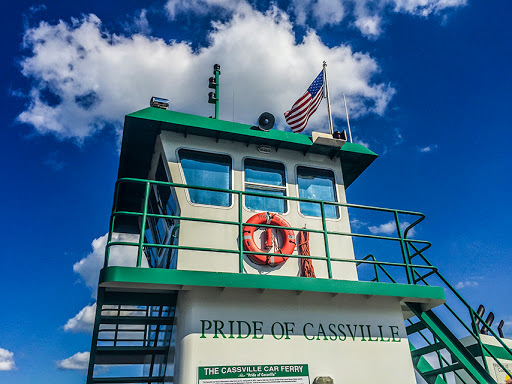 Cassville is located dead center in the longest unbridged section of the Mississippi River, with thirty miles at least in each direction to the nearest bridge. To the South is Dubuque, and North, Prairie du Chien and Marquette. Fees range from $2 one-way for a walk on passenger to $15 one-way for a car to $50 one-way for a semi-trailer. The route does not cut straight across the river. The ferry loads on Prime street in Cassville and travels up river for about 1 mile and unloads near the mouth of the Turkey River. In one direction travel takes approximately 20 minutes. 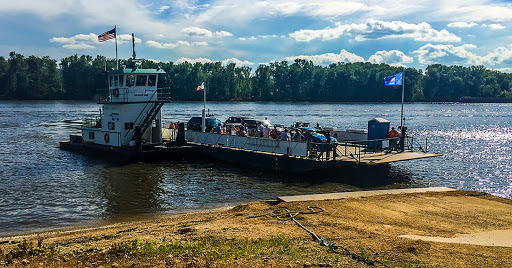 While there is no town at Turkey River, many passengers walk on and ride the ferry round trip to satisfy nostalgia and for a pleasure ride. The route is also popular with touring motorcycle groups. In 1836 a wanderlust Nelson Dewey came to Cassville by way of the ferry from Turkey River Iowa. In that time, Cassville was located at the geographic center of a territory that included Michigan, Wisconsin, Minnesota, and the Dakotas. Had that territory remained contiguous and become a state Cassville held a claim to be the capital city of what might have been an enormous and prosperous state. Dewey took up work as a clerk and lawyer for a firm that was engaged in building the infrastructure of a state capital at Cassville. Indeed a state came to be, but a land speculator (shark) named James Doty won the right to establish the Capital of Wisconsin at Madison by ensuring handsome bribes of land, cash, and appointments to those who would vote his way. This result was a catastrophe for Cassville, but Nelson Dewey managed to win election as the first Governor of Wisconsin. The honorable Nelson Dewey later returned to Casseville and purchased the ferry line which was powered by two horses walking a treadmill. By 1890 the Ferry was running a slick business by transporting cabbage harvested in Iowa and canned at Klindt Geiger Canning Company in Cassville. Nelson Dewey died a pauper after suffering a house fire and market crash, and having been left by his wife. Had Dewey been invested in Doty's dream of Madison his fortunes may have been different - but at the time Madison was nothing more than a swampland without a railroad, river, or port. 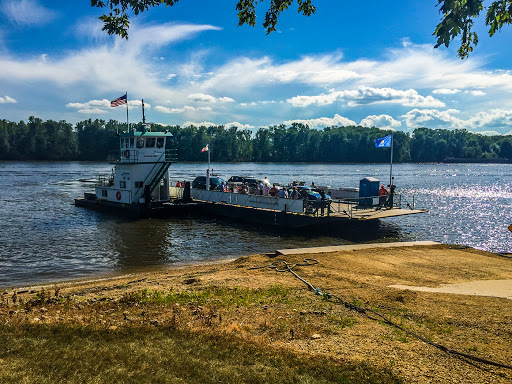 And, even after Madison was selected as the capital, many other speculators predicted that the Capital would be moved to a town that could combine riverboat and railroad service. 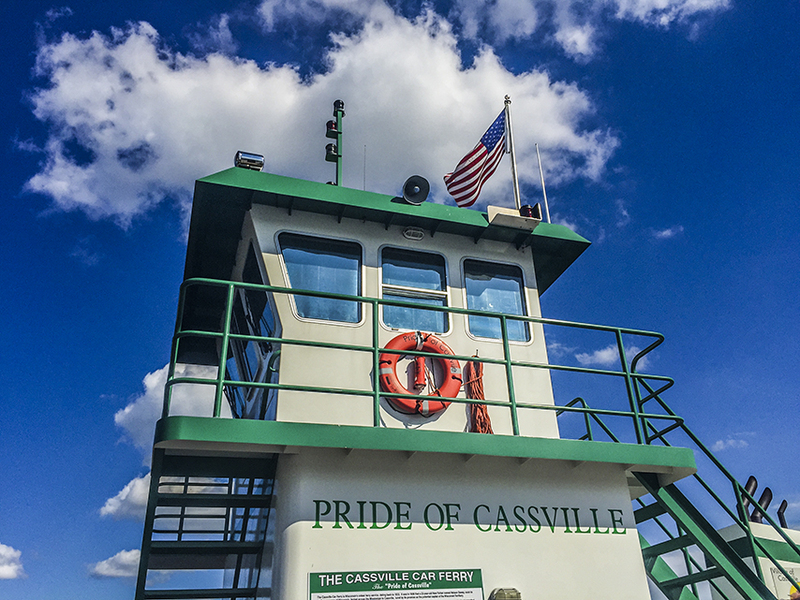 The Cassville ferry was converted to gasoline power and later a steel hull raft replaced the wood raft to accommodate automobiles. 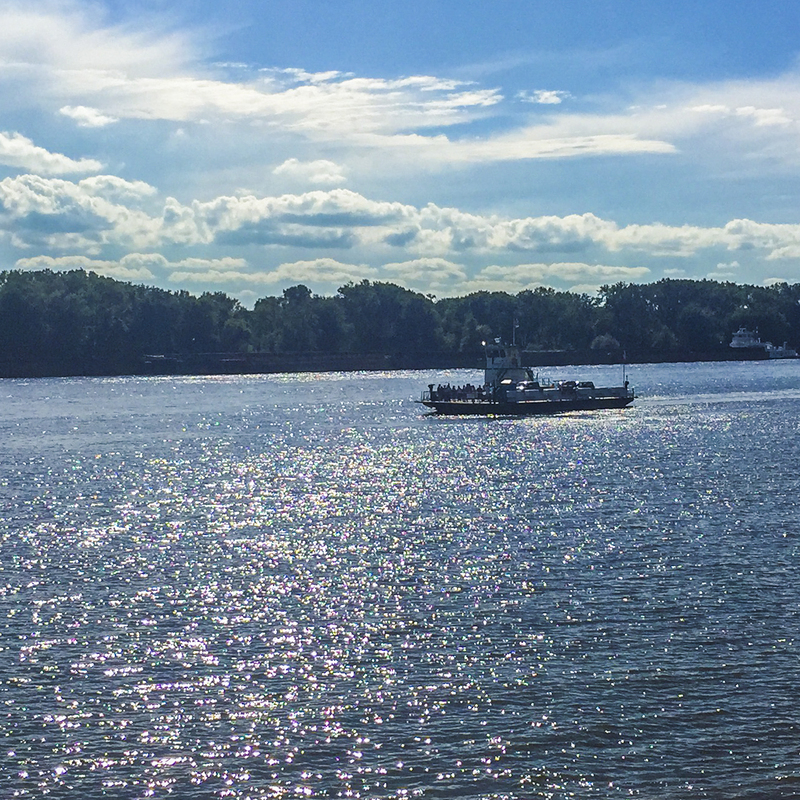 Ferry service stopped between 1940 and 1988, but was revived by the Cassville Harbor Commission. 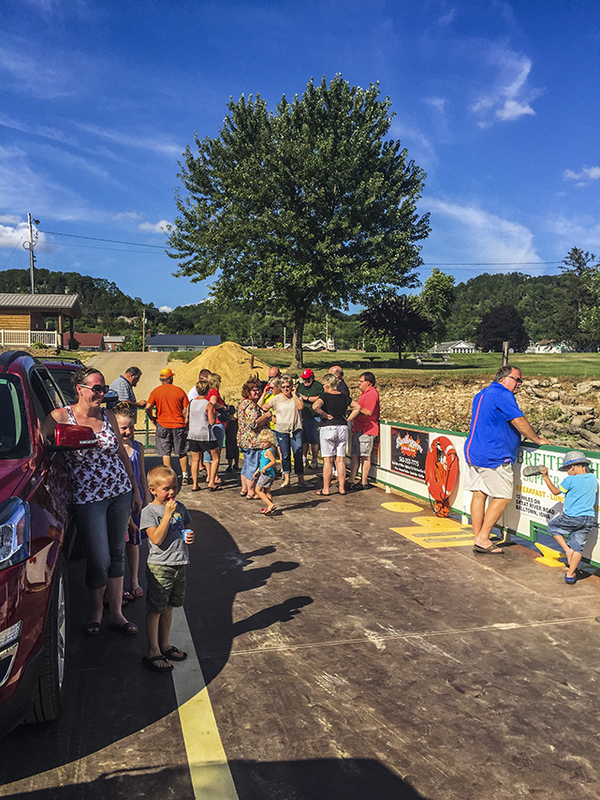 It remains a popular tourist diversion for those traveling the Great River Road. In the 1850's a river packet, name unknown was proceeding up-stream. She was bound for St. Paul and was loaded down with heavy cargo. Among the merchandise were some packages of asparagus seed, a toothsome vegetable being unknown in the home gardens of the Upper River towns. 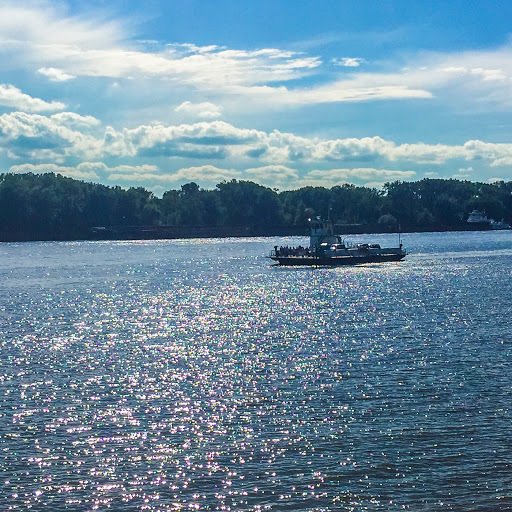 When this vessel reached Turkey River she struck a snag which ripped up her bottom so badly that she sank in a short time. What became of her crew no one knows. The packages of asparagus seed, which were on her lower deck, floated ashore. Here the seed germinated and there in the years following asparagus plants were distributed on the Casseville shore. To-day, in the asparagus season, people go to collect the fugitive asparagus. Asparagus roots from this region have been planted in gardens in the entire country round. The hiking trails at Nelson Dewey State Park combine to make a 2.3 mile easy to moderate double loop. These include: Mound Point Trail, Oakwood Trail, Dewey Heights Prarie Trail, and Cedar Point Trail. 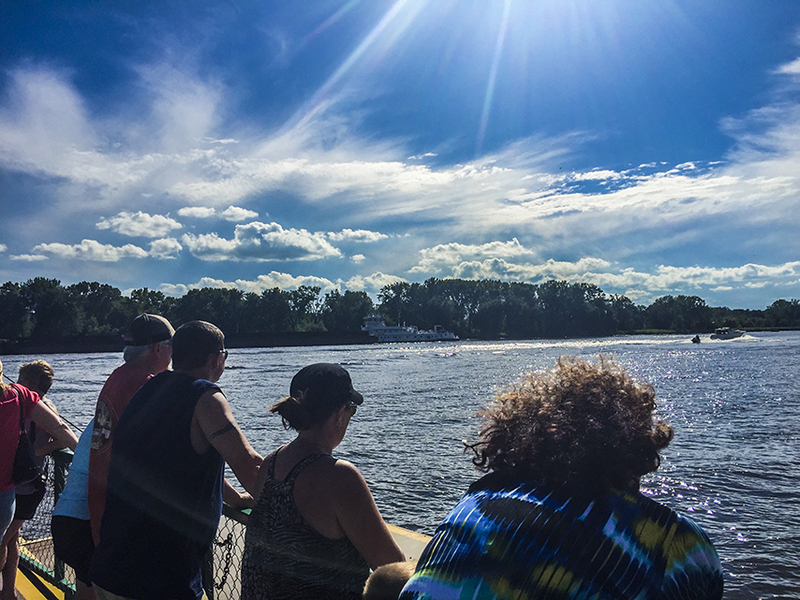 All are laid out in linear lengths ontop of a bluff with commanding views of the Mississippi River. Spook Cave is a privately owned and operated show cave and campground located along Bloody Run in McGregor Iowa. This unique cave tour floats adventurers on a 40 minute boat tour of the flooded Spook Cave. This original 1950's roadtrip attraction remains unchanged today. In fact, the seven punts used to glide tourists through the caverns are the original boats commissioned for this tour. The Dickeyville Grotto is a must-see roadside attraction in America for anyone who loves craft and admires detail. You'll find the grotto on the grounds of Holy Ghost Catholic Church in Dickeyville WI. A five minute diversion off the freeway (Highways 151, 61, and 35) between Platteville and Dubuque, The Grotto welcomes travelers to the Southern end of The Great River Road in Wisconsin. Here, in the early 1900's a priest and pastor, Father Matthias Wernerus, set himself to the design and construction of mind-blowing mosaic encrusted structures.